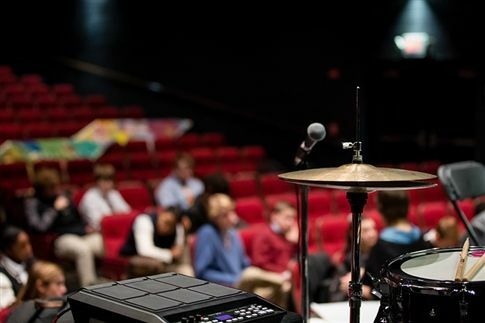 After interactive performances with our Middle and Upper Schools on Thursday morning, the Creative Connections trio invited any interested student to brainstorm creative ideas from singing and instrumental performance to spoken word poetry and visual artwork. Their goal was to create an original piece of music that reflects the individual and collective identity of our students. 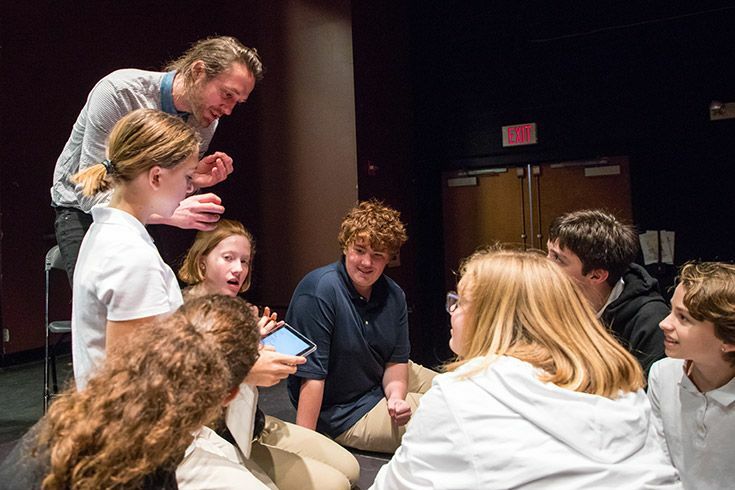 Creative Connections interacts with the crowd during the Middle School introductory performance. Students formed groups all over Price Auditorium to work out their ideas with each other. Sam, Jill and Ross served more as facilitators than leaders. They helped the kids organize generally but then stood back to let our students' voices come through. 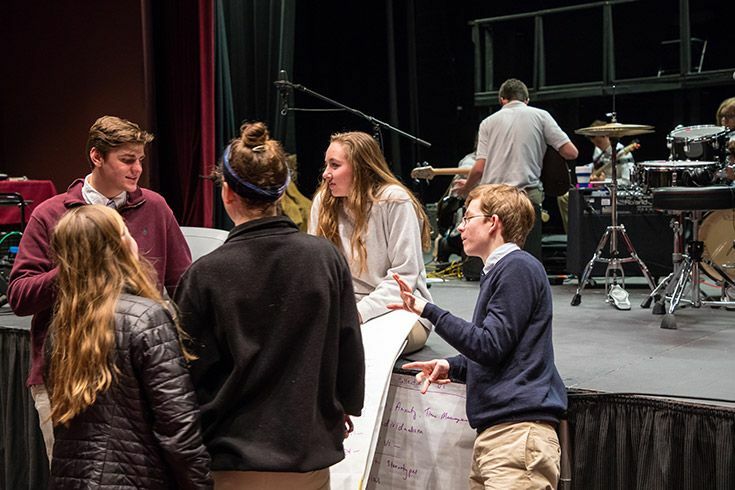 Upper schoolers collaborate on a spoken word piece. 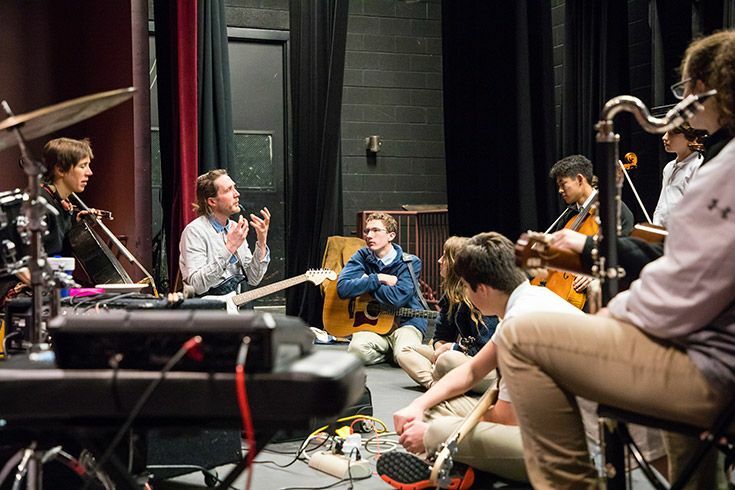 Sam offers guidance as middle schoolers brainstorm musical ideas. Throughout the two days, different groups of students jumped into the mix at different times. One moment, you’d hear Treble Choir and Vocal Ensemble working out harmonies. 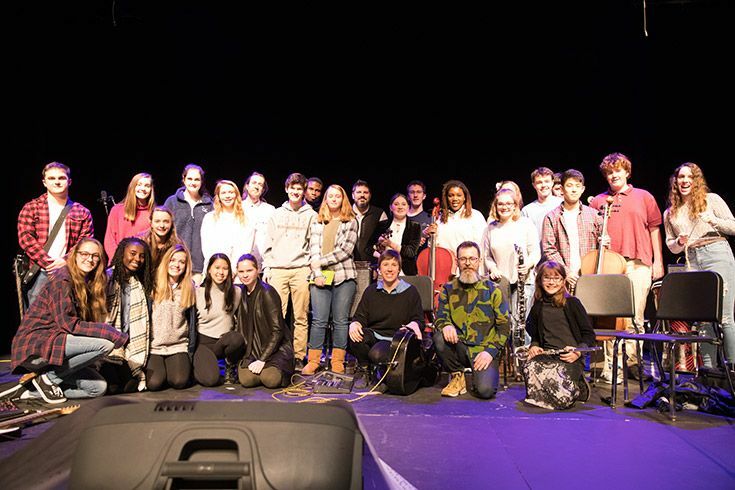 The next, sounds of horns and strings would dominate the space as students from Jam Band, Chamber Music Ensemble and Instrumental Ensemble improvised on stage. There were no boundaries to these sessions, any student could join in whatever way inspired them to do so. Jill and Sam with a mix of Upper and Middle School musicians. Visual artists gathered near the musicians, using the energy of the space to create both personal and collaborative works of art. As the trio worked with each group, students from all grades would drop in and out, contributing their talents to the collective. Ms. Carsley’s drawing and painting students use the energy of the room to inspire individual work. 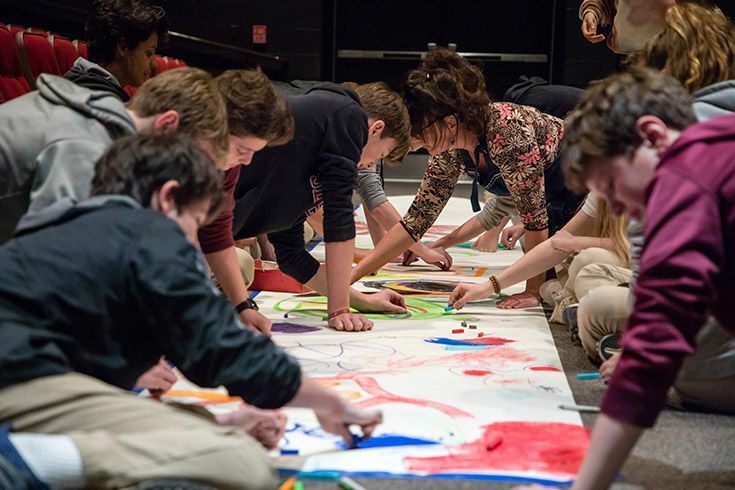 Ms. Carsley works with Middle School students on a large collaborative piece to display at the Friday concert. There were students who recorded a "Voices of Severn" soundscape using sound bites from life at school with special effects. 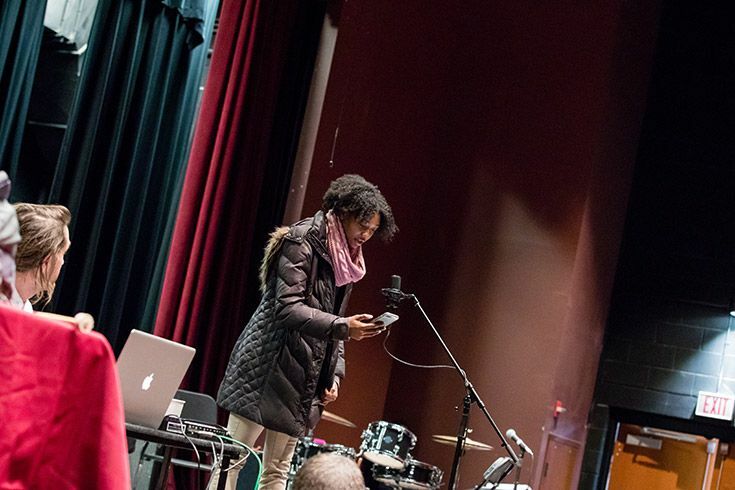 And during one of the working sessions, Sam called students to the stage to record their thoughts and questions — all to incorporate into the final piece. These reflections were personal, political and humorous all at once, a window into the experiences of our students as they consider their place in our school and in the world. 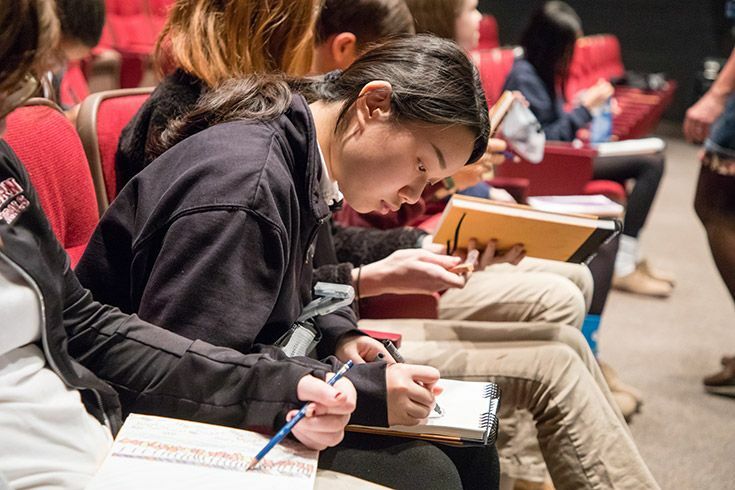 Every student had an opportunity to weave their voice into this event — whether on stage, at the mic, with a sketchpad or behind the scenes. Students stood one by one to share prepared questions as Sam recorded samples of each. As extraordinary and student-centered as the process itself, the performance on Friday night was all about the kids. The performance titled “I Collecting Us” could best be described as a musical look into what it’s like to be a young person in the world today. The audience could feel the emotion in the room as our performers swelled with melancholy, joy and everything in between. It was an intimate show, expressing something quite personal and uniquely Severn, born of the thoughts, passions, humor and talent alive in our students. Sam on stage with the Friday night performers. Our Severn Creative Connections crew! 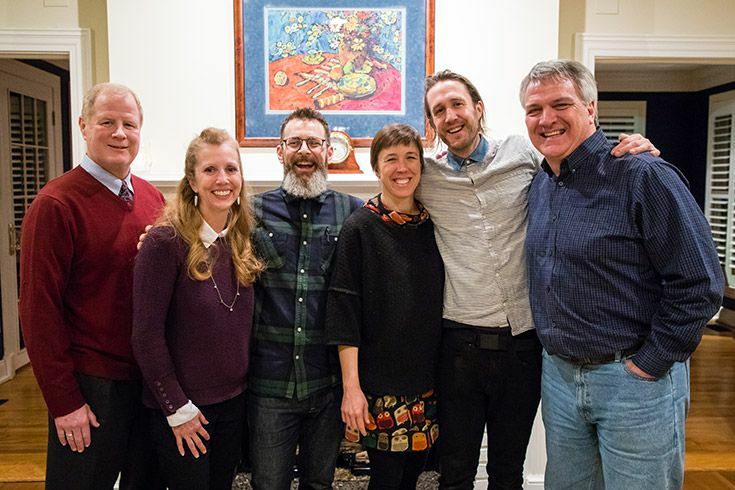 The Dillon Moran Musician in Residence program was created in the Fall of 2012 to commemorate the passion, exuberance and solid musicianship exemplified by Dillon Moran, Severn School Class of 2013. Dillon’s life was tragically cut short in the fall of 2011 as the result of an accident at his home in Davidsonville, Maryland. 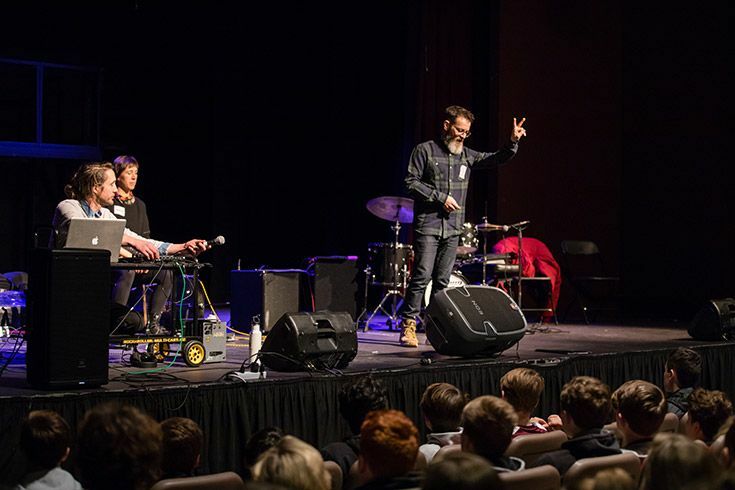 The purpose of the program is to invite outside musicians to spend a defined period of time at Severn working with students, faculty, and the entire community to inspire, create and perform great music. 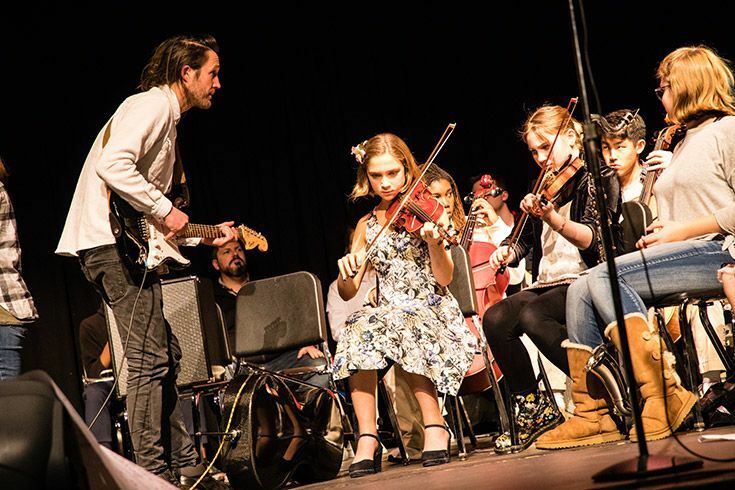 The visiting musician will share his/her talent with Severn students and hopefully provide a fresh approach and new ways of bringing music to life in the Severn community. View from the stage during a session with Creative Connections.